Enter the world of BERNINA embroidery with the new BERNINA 580 E.
The new B 580 E will wow you with its simple, yet classic design, combined with superior function to set new standards. 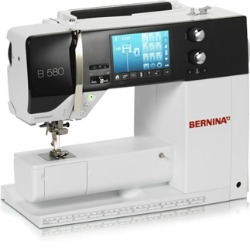 The B 580 E combination sewing/embroidery machine is compatible with the BERNINA Stitch Regulator, BERNINA Embroidery Software V6 and the CutWork Accessory and Software. Come in to our store and enjoy the test drive.